Supply was once the big problem. Now, as some of the major collectors of the last generation look to sell, the market is desperately in need of new buyers willing to give them a return on their investment. The signs are, however, that although good things are again available, the price levels of the 1990s are unlikely to be sustained. On paper the summer series of golfing memorabilia sales promised much. Sotheby's and Christie's are no longer pursuing this market outside of traditional sporting sales but Lyon & Turnbull (19.5% buyer's premium) had decamped from Edinburgh to Thornton Manor, Wirral on July 15 to sell 425 lots close in time and proximity to The Open at Royal Liverpool. Their offering included the first part of the Leo McNamara collection, one of the most impressive US private collections of golfiana, comprising more than 3000 clubs and 300 balls tracing the evolution of the game over two centuries. Part Two of the McNamara collection will be offered from L&T's sister saleroom, Freeman's of Philadelphia on October 21 and the final tranche in Edinburgh in January 2007. They will be hoping for better next time. Against the backdrop of a weak dollar, only 176 lots were sold and most of the high profile entries were passed at estimates that, if sensible a decade ago, now look outlandish. There was the occasional surprise - a longnose playclub with a cracked fruitwood head carrying the names of both Hugh Philp and Allan Robertson tripled its mid estimate at £7500 - but there was a longer list of casualties. A smooth gutty from the Harry B. Wood Collection estimated at £20,000-30,000, an apparently unused Willie Dunn Stars and Stripes pattern ball (estimate £15,000-18,000) and a Willie Park 'Park Royal' hexagonal faceted gutty ball retaining much of its original paint (estimate £17,000-20,000), were three exceptionally rare golf balls that all found the water hazard. At the other end of the price scale buyers looked sniffily upon bundles of standard hickory clubs priced in the £100-200 range. A successful £5500 (estimate £6000-8000) bid was taken for an Allan Robertson feather ball stamped Allan and numbered 27 in ink. 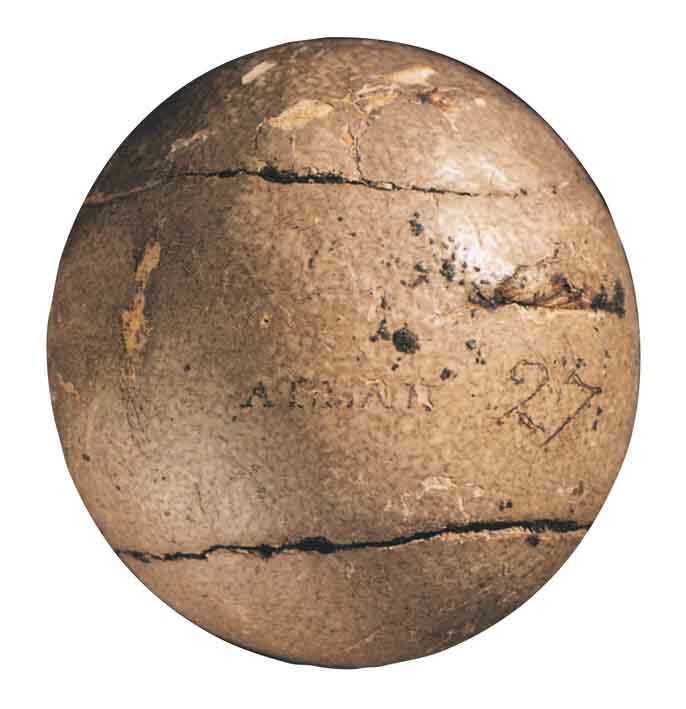 This almost mint ball c.1850 was given to Tommy McNamara - Leo McNamara's father who was runner-up in the US Open three times - in 1920 by John Forgan to mark his participation in the British Open. He was the first American-born player to compete in golf's oldest tournament. 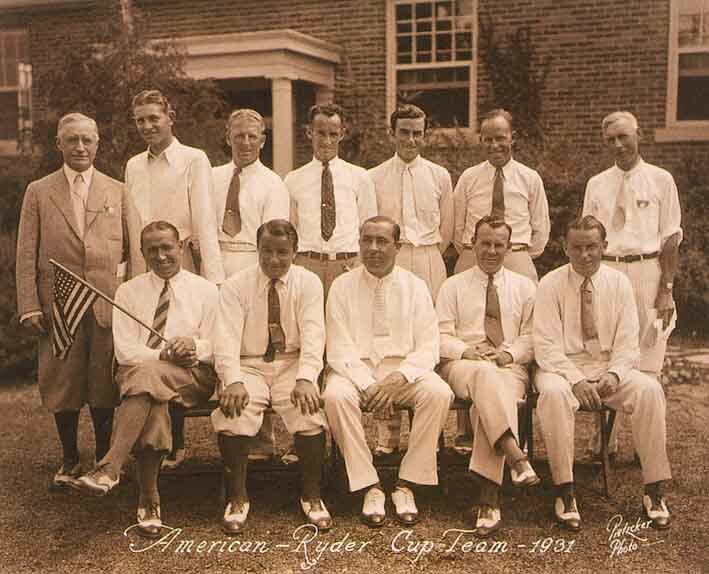 Also of US interest was a Pietzcker sepia photograph depicting the 1931 America Ryder Cup team sold at £6500 (estimate £6000-8000). Walter Hagen was in his pomp. During the competition at Scioto Country Club, in Columbus, Ohio - one that the US won at a canter 9-3 - he teamed with rookie Denny Shute for a 10 and 9 foursomes victory over Great Britain's George Duncan and A.G. Havers. Also included in the 16 x 20in (41 x 51cm) image is the English seed merchant and entrepreneur Samuel Ryder who a decade earlier had agreed to put up the funds for a gold chalice to be awarded the winners of a regular transatlantic match. Bonhams (17.5% buyer's premium) had a copy of that famous trophy in their sale of July 17, a gilt replica, 9in (22cm) high, made by Asprey & Garrard and engraved Max Faulkner Ryder Cup Player 1947-49-51-53-57. It was one of many made and presented to all living British and European Ryder Cup Players in 2001 - and one of 20 lots entered by the family of Max Faulkner (1916-2005) who won the Open at Portrush in 1951 and was known as Flamboyant Faulkner, due to his custom of playing dressed in handmade shoes and brightly coloured trousers. It sold well at £4600 (estimate £2000-3000). 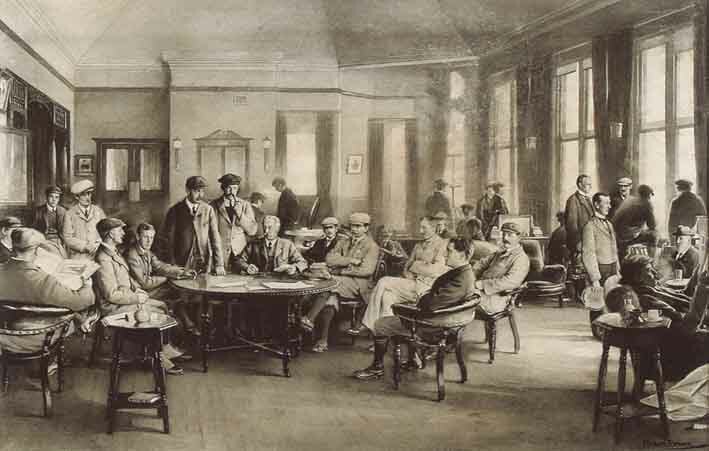 This Chester sale, where 295 of the 539 lots sold, included another clubhouse trophy lot, a signed and dated watercolour and pencil en grissaille by Michael Brown depicting a meeting of Surviving Amateur Champions - Hoylake 1906. Brown famously painted 26 golf pictures for Life Association of Scotland calendars from the late 1800s to the early 1900s, each almost photographic image depicting some real or imaged scene from the annals of British golf. Eighteen of the 16 originals were sold at Sotheby's in July 1995, when three of them exceeded £40,000 and five exceeded £30,000. The manager of the London office of the Life Association of Scotland gave this 13 x 20 in (32 x 50cm) painting that had featured in the 1907 calendar to the present owner in 1977. It had been damaged (mainly to a small area in the top right quarter) during the Blitz but was professionally restored in 1996. Bonhams thought it could replicate 1990s prices and anticipated bidding to reach £25,000-30,000. However, it was snapped up at £20,000. In the equivalent sale in January 2005, Bonhams had sold a Silver King Man shop display figure at £6600. One of less than 20 known to have survived, this is regarded as being the second most difficult point-of-sale figurine to find (the Silver King Queen is the rarest) but another was found for 2006. In comparable condition, retaining most of its paint and base lettering but repaired to the hand holding the club, it sold at £4000. Keeping expectations down to modest levels paid dividends. 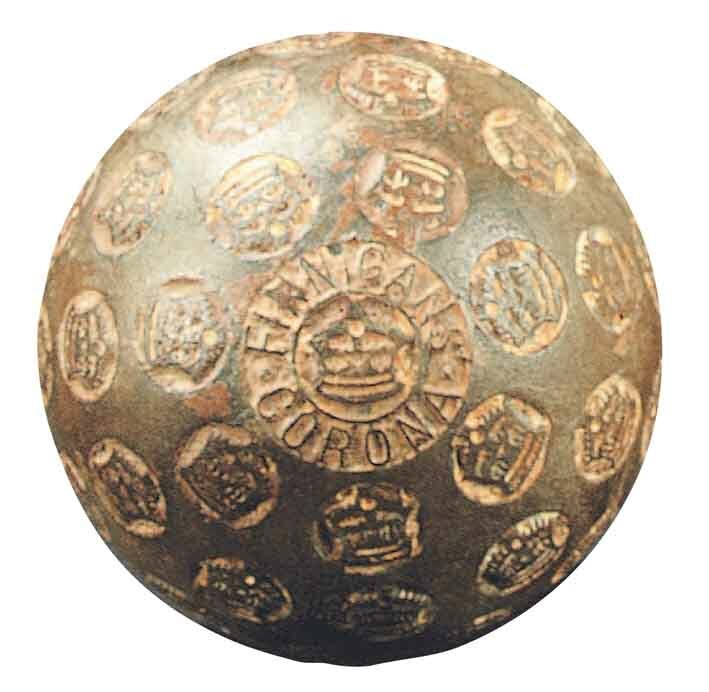 A chocolate brown 'Corona' patent indestructible ball, with its distinctive cover pattern of crowns within indented discs, sold for £3200. It is a ball that features in several well-known texts although only two are known. They were sold by Finnigans, a high-class department store with branches in both Liverpool and Manchester, names that are stamped to the ball, the other pole with the patent No. 598246. 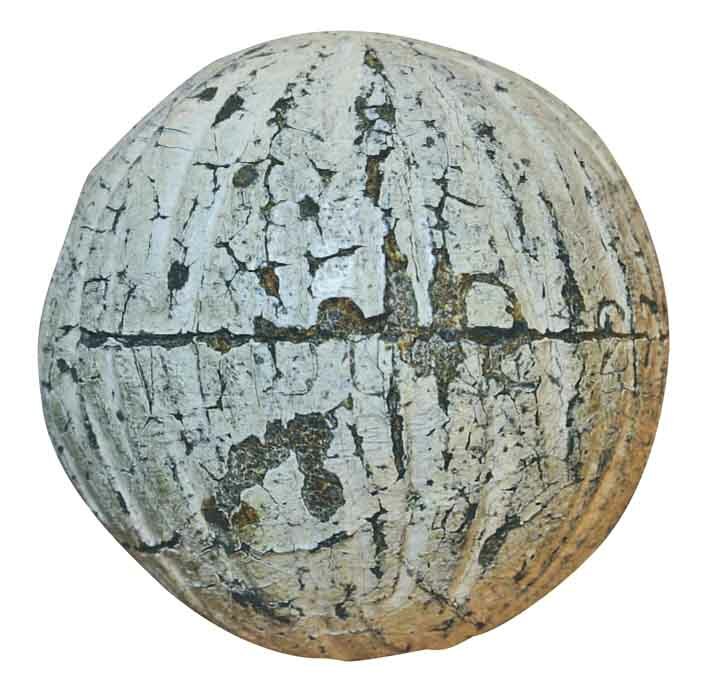 Failures at L&T ensured Shropshire based Mullock Madeley (15% buyer's premium) would sell the most expensive golf ball of the season - an extremely rare hand hammered gutty golf ball c.1850 by Willie Dunn Snr. Not only is this ball stamped Dunn 27, it is hammered with longitude lines and retains much of its original white paint finish. Mounted on a small wooden shield inscribed in faded ink, First Gutty - presented May 1891 - 40 years old, it sold to a collector at £7100 (estimate £6000- 8000). It was the best selling lot of a £200,000 sports memorabilia sale conducted at The Old Shippon, Wall-under-Heywood, Church Stretton on July 12-13. It was an impressive sum but paled next to the $17,500 it had brought in 1999 when sold by Bonhams & Doyle New York.